Readers, yes, you read the title correctly. 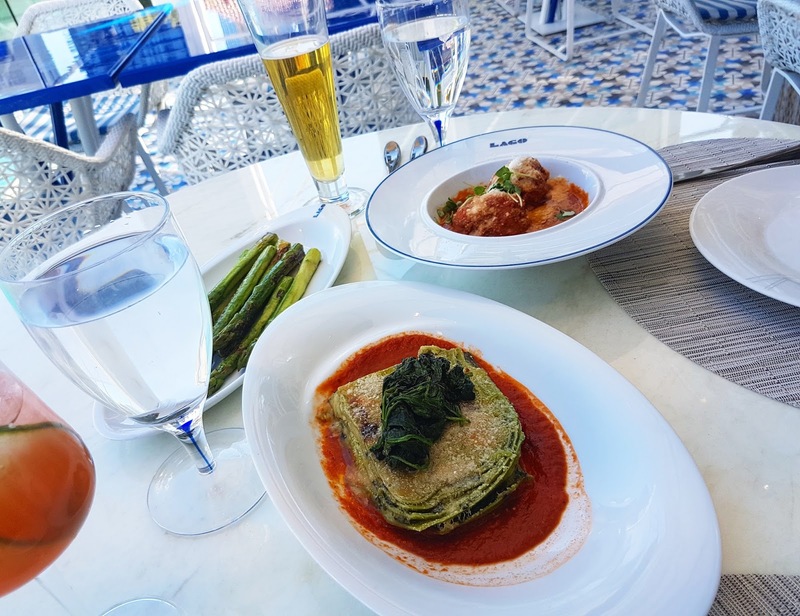 It is possible to dine at Bellagio in Las Vegas for under $100 for two people. Bellagio is without a doubt, the jewel of Vegas’ crown. In the middle of the strip, escalators leading to the entrance surrounded by the biggest fountains I’ve ever seen and crucially, a great place to play the 1c slot machines if you’re in town with no plans to gamble big time. 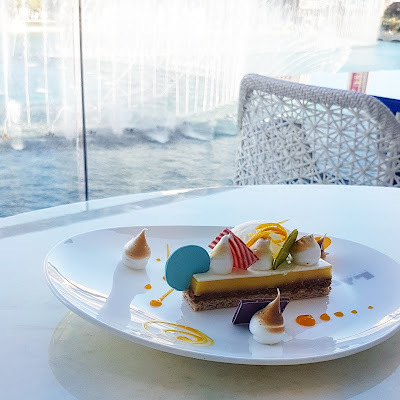 By chance I read a Vegas blog when I was looking at places to go for some fine dining in Vegas, as a break away from fried chicken and waffles (I won’t lie to you all… they were amazing, but back to that later). I’d read online that Lago, run by award winning Julian Serrano was a pretty amazing place to go if you are into tapas style dining and small plates… they have a gorgeous European style sun terrace and best of all, it’s in the middle of the front of the hotel, overlooking the famous fountains. But shhhhh…. Here’s the bit not many people know. Bellagio’s famous fountains start at 3pm. The last sitting for lunch is at 2.30pm… looking for the best seats in the house for the dancing water whilst enjoying delicious food? 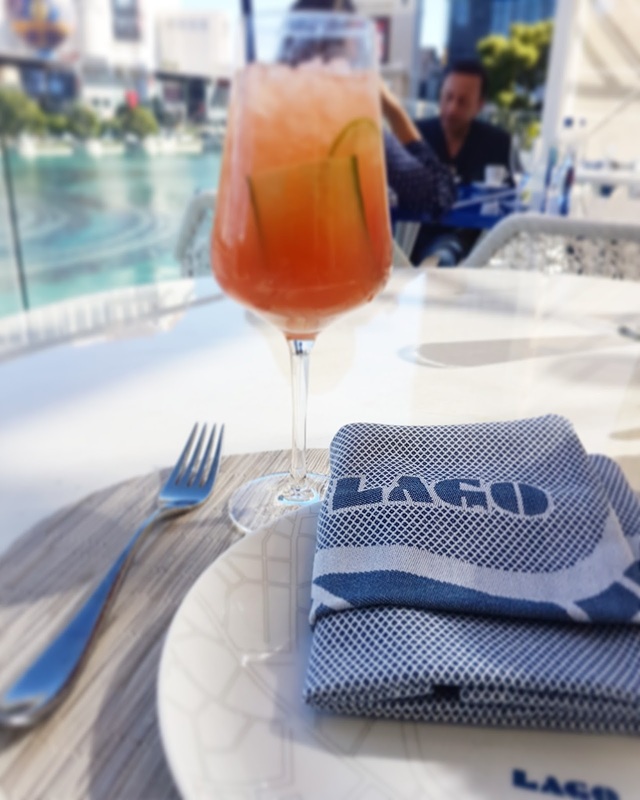 Lago could be the place for you. The best bit – they do a 3 course prix fix lunch menu for $28 per person. Not widely advertised, but its right there in the middle of the menu if you look closely. The servers might not mention it, but if you’re keen for Bellagio on a budget – this might just get you there. We pre-booked well in advance, as Bellagio is world famous. We went on a Monday, so possible quieter than a weekend in the height of summer, but by the time our mains appeared, we had the terrace to ourselves. 15 minutes later, the fountains came on and are nothing short of spectacular. I could only describe it as feeling like we were part of a private showing as there was nobody else around us. The water feature is so huge, that the tourists on the pavement opposite, may as well have been ants! Aside from the spectacular setting, it’s a great place to escape the madness of the Vegas strip. The terrace has a laid back vibe, cocktails and great beers are available and special mention should go to Antonio from Lisbon who was our server. He never rushed us, left us in peace to enjoy the view and provide some recommendations of things we might enjoy off the menu. I started with the antipasto plate – filled with Spanish cured meats, cheeses, olives and roasted peppers. So much for small plates… I could have shared my plate with Mr WhatClaireDid as it was HUGE. But in the spirit of testing the food for the blog. I wired through by myself. Mr WhatClaireDid went for the equally delicious seafood salad. After a bit of a breather, we got stuck into the Italian themed mains – this time a bit smaller, but still enough to feel satisfied after. Note – we went wild and ordered rosemary potatoes and grilled asparagus on the side but even without these, the small plate sizes were filling. I had two gigantic meatballs whilst the lasagne verde was served across the table (tried a little, it was also fab). The only thing you don’t get to choose is the dessert, which is noted on the menu as “chefs choice”. Provided you’ve no food fears and are open to try anything, you’ll probably not be disappointed. We were served a delicious tiramisu with coffee ice cream and a lemon meringue slice with pastel coloured chocolate disks. Presentation was beautiful. 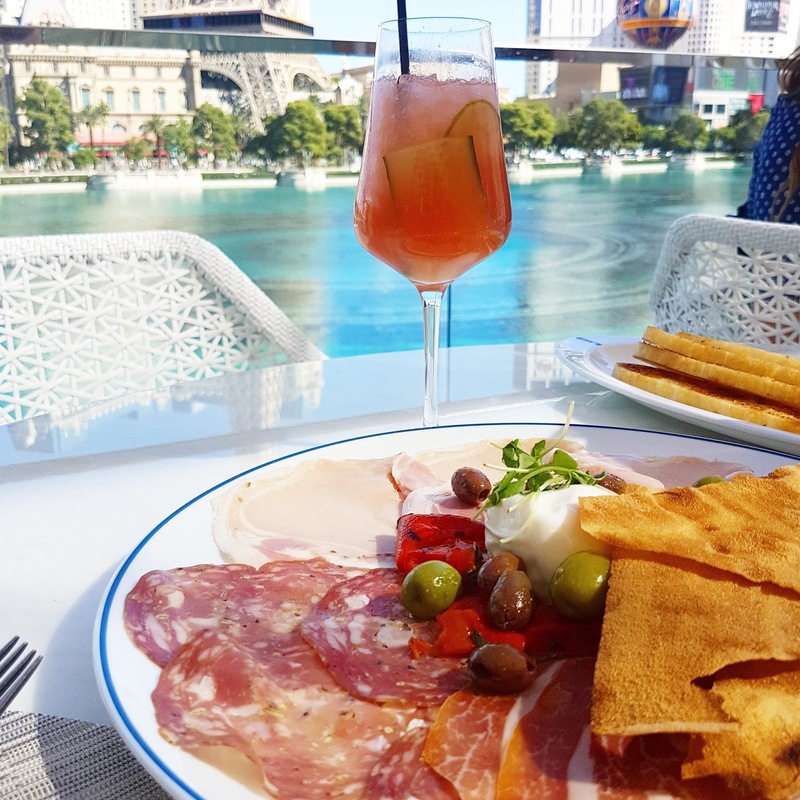 After an amazing lunch, we took the time to enjoy our drinks in the sun overlooking the fountains and never once felt rushed. A little piece of tranquility on the Vegas strip. And if you get the chance, don’t rush out after lunch. Enjoy the themed display around the lobby (Autumn was the feature during out visit), take a stroll around the shops and make sure to place your bets in their famous casino… for a small tip, waitresses will make sure you have a drink in hand as you place your bets. So there you have it, lunch for under $100 for two at the famous Bellagio resort. or to find out more about Bellagio, check out their Facebook page. Thanks Emma. Hope you enjoyed your time in the USA. Definitely an excuse for you to go back to Vegas now! I am staying at the Bellagio in May 2017. Last time I was there I stayed at the Wyndham which is all the way down the other end of the strip. The dessert thing is worrisome because I have a nut allergy and do not like tiramisu. Nice presentations.